With exciting, colourful and inspirational activities cropping up in a host of weird and wonderful venues ranging from museums and shopping centres to schools, busy streets, a farmers’ market and a café, the festival will run from Friday 14 until Sunday 23 March 2014. The programme was appropriately unveiled today in the shadow of the 16th Century Abbot House in Dunfermline when The Black Watch Castle and Museum of Perth showcased some of the historic weaponry being used during their festival events. They demonstrated a range of ancient weapons, a Basket Hilted Broadsword, Brown Bess Musket and a Short Magazine Lee Enfield rifle, some of which will feature in their explosive event, ‘From Flintlocks to Rifles’, at Dunfermline’s John Marshall Community Leisure Centre on Saturday 15 March 2014 and during ‘Science in the Shopping Centre at Kingsgate Shopping Centre on Sunday 23 March 2014. 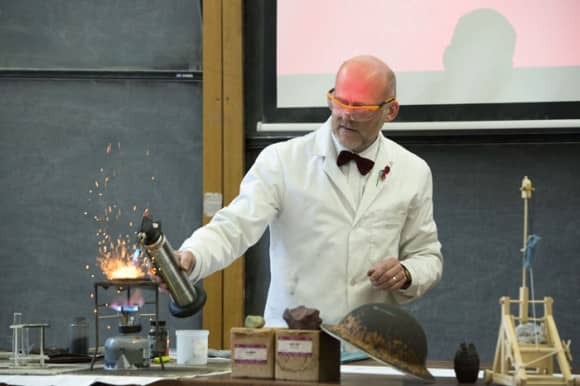 Funded by The Scottish Government and Fife Cultural Trust , the festival will involve a diverse range of free events for the general public and both primary and secondary schools, all coordinated by Dundee Science Centre and Fife Cultural Trust. Other festival highlights range from science busking in the streets of St Andrews and rocket-making at the Cupar farmers’ market, to family fun days in Glenrothes and a lively look at astronomy through the ages. Children can also learn how to be a scientist and explore forensics at Thornton Primary School, be wowed by some amazing experiments at Methil Heritage Centre, and make plastics fantastic at the Earthship Fife Visitor Centre in Kinghorn. The festival will also incorporate an impressive schools programme with topics on everything from medieval Construction and WW1 communications to lego, light and video game design! Meanwhile, Heather Stuart, Chief Executive Officer, Fife Cultural Trust added, “Fife Science Festival adds to the diverse range of cultural opportunities which Fife Cultural Trust delivers with its key partners. The festival supports Fife Cultural Trust’s vision of making Fife a culturally vibrant and rewarding place to live, work or study.